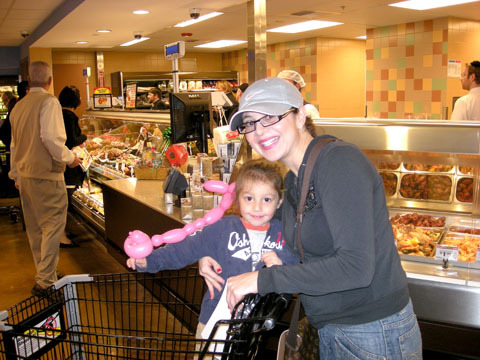 SHOPPING AT the new Kosher Experience section of Ralphs Grocery are Margot Grabie and her son Judah. Wider aisles, new décor and a full-service kosher department are among highlights of Ralphs Hancock Park remodeled grocery store at 260 S. La Brea Ave.
“We improved every inch of our Hancock Park supermarket, completely redesigning the layout,” said Donna Giorano, president, Ralphs Supermarkets. Organic produce, a fully-staffed meat department and fresh seafood, bakery with freshly baked breads and a floral department are among features of the 50,000-square foot store. Serving the area for 51 years, the renovated space includes the 1,500 square foot “Kosher Experience” with thousands of items, a delicatessen, bakery and meat-processing room that follow all Jewish dietary laws. Another deli on-site offers freshly made entrees and sides to go. A full-service pharmacy is also at this energy-efficient store which will consume 15 percent less than the typical store. Ralphs Hancock Park employs 190 full- and part-time employees. “We’ve put together a great team,” said store director Joe Valencia. Store officials made donations totaling $10,000 to four area schools: Burroughs Middle, Fairfax High, Los Angeles High and Yeshiva Aharon Yaakov Ohr Eliyahu. The L.A. High marching band performed at the ribbon-cutting ceremony Feb. 6.